All About Roasting - Description | W. W. Norton & Company Ltd.
A master teacher provides delicious recipes and explains the principles behind the essential technique of roasting. 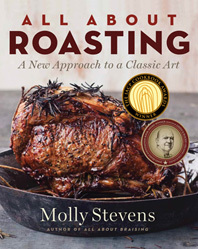 Successful restaurateurs have always known that adding "roasted" to a dish guarantees immediate appeal. 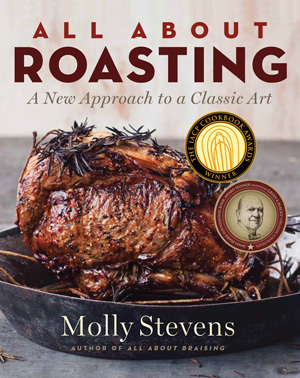 Molly Stevens brings her trademark thoroughness and eye for detail to the technique of roasting. She breaks down when to use high heat, moderate heat, or low heat to produce juicy, well-seared meats, caramelized drippings, and concentrated flavors. Her 150 recipes feature the full range of dishes from beef, lamb, pork, and poultry to seafood and vegetables. Showstoppers include porchetta ingeniously made with a loin of pork, a roast goose with potato-sage stuffing, and a one-hour beef rib roast-dishes we've dreamed of making, and that Molly makes possible with her precise and encouraging instructions. Other recipes such as a Sunday supper roast chicken, herb-roasted shrimp, and blasted broccoli make this an indispensable book for home cooks and chefs. All About Roasting is like having the best teacher in America in the kitchen with you. From the perfect pot roast to the fragrant complexity of braised endive, there's no food more satisfying than a well-braised dish.